Ambassador Samantha Power says the United States is reviewing reports that Iran launched a ballistic missile last month. The United States is reviewing reports that Iran launched a ballistic missile last month in violation of UN Security Council resolutions, U.S. 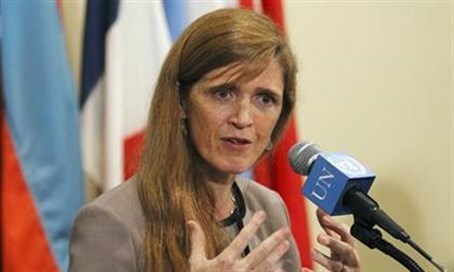 Ambassador to the United Nations Samantha Power said on Tuesday, according to Reuters. "The U.S. is conducting a serious review of the reported incident," she was quoted as having told reporters after a meeting of the Security Council on unrelated issues. She added that if Washington confirmed the reports that Iran tested a medium-range ballistic missile on November 21 in violation of UN resolutions, the United States would bring the issue to the 15-nation council and seek appropriate action. On Monday, a senior American official told Fox News that Iran carried out a test of the Ghadr-110 medium range ballistic missile. According to the source, the test was held November 21 near Chabahar, a port city in southeast Iran’s Sistan and Baluchestan Province near the border with Pakistan. Under that deal, reached on July 14, most sanctions on Iran will be lifted in exchange for curbs on its nuclear program. According to a July 20 resolution endorsing that deal, Iran is still "called upon" to refrain from work on ballistic missiles designed to deliver nuclear weapons for up to eight years. In October, Iran also reportedly conducted a ballistic missile test, eliciting strong condemnation from members of the UN Security Council. Shortly after the October missile test, White House press secretary Josh Earnest said Iran likely violated UN sanctions, but stressed that the test would not affect the implementation of the deal reached with world powers. Power later stated the missile launched by Iran is a "medium-range ballistic missile inherently capable of delivering a nuclear weapon". Iran has rejected claims that the missile was capable of delivering a nuclear warhead and also rejected the idea that the missile test was against UN resolutions. Nevertheless, the United States, Britain, France and Germany subsequently called for the United Nations Security Council's Iran sanctions committee to take action over the missile test. So far, no action has been taken by the committee, though Power said council members would be discussing the issue next week, according to Reuters. In Paris, a Foreign Ministry spokesman said France would pay close attention to ensure Iran respects the ban on ballistic missile tests. He did not specifically confirm the launch and officials declined to comment when pressed. Iran continuously carries out long-range ballistic missile drills as it routinely shows off its military program. The country’s domestic long-range ballistic missiles are, in fact, nuclear capable, according to international reports, particularly the Shahab 3 and Sejjil 2.